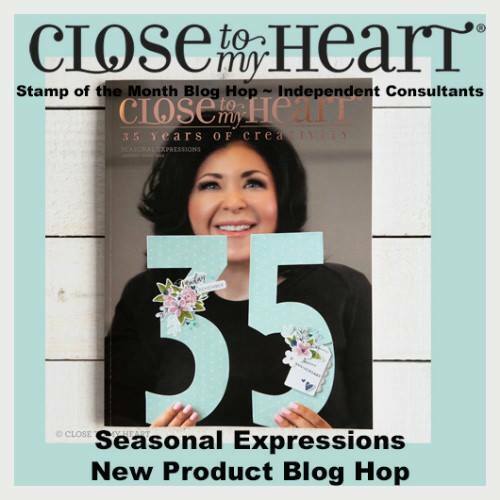 Welcome to the CTMH "Seasonal Experssions New Product" Blog Hop. If you came here from Marciava Warrell's blog you are on the right path! The blog hop is a great big circle, so you can start here and work your way all around. If you get lost along the way, you’ll find the complete list of participating consultants on Melinda’s Blog: HERE. This month we have 16 CTMH Consultants sharing their creations using product from our new CTMH Seasonal Expressions Idea Book. This is simple to do - just click on the link at the end of the post on each blog to move to the next one! I decided to make a special birthday card for a child at church. This card 5 X 7 lays flat and pops up when taken out of the envelope and can stand on a shelf to enjoy for a long time. I got the idea from pinterest where I linked to Maymay Made It blog with instructions. I used the Stamp of the Month - "Card Captions" for the "Happy Birthday" and on the back "Congrats" will get that photo posted also. I also used the "Something Fierce" paper and compliments. The workshops; scrapbooking and cardmaking also look great!! It's been a "fierce" week at work so I didn't have time to finish this as I planned. I will add a second take and include photos of the cuts. This is a fun card. and can be made any size, vertical or horizontal and works great with our double sided paper. This card base was made with the willow paper cut at 5 X 7. I cut the pop-up scallop using Fancy tags thin cuts and only cut the scallop portion, positioning the tag part so it didn't cut. (demo photo later) I also used the scallop border from the "Decorative Borders" thin cuts for the "bridge" portion. One heart I had laying around was the "Stitched Hearts" thin cuts. Outstanding! Another fabulous card from you (as usual). Great work! Cute card! I love how it pops! What a COOL CARD, Darlys!! !